Washington, DC – In one of the most divisive political battles of President Donald Trump‘s presidency, US Republicans are moving forward with a risky showdown vote on the Supreme Court nomination of Brett Kavanaugh following accusations that the judge sexually assaulted Christine Blasey Ford when they were both teenagers. Kavanaugh, who has denied the allegations, had appeared to be on the fast-track towards being nominated until Ford’s accusations came to light last month. Now, after a highly-emotional public hearing and an FBI probe, the judge’s fate appears to unknown. Trump nominated Kavanaugh to replace retiring Justice Anthony Kennedy on July 9. According to sworn-testimony, Ford called her congressional representative three days before the nomination was announced, saying one of the candidates on the president’s “short list” had sexually assaulted her when they were teenagers. She also called the Washington Post’s confidential tip line, with the information, but did not provide her name. After the nomination was announced, Ford met the staff of California Congresswoman Anna Eshoo on two separate occasions, the professor said in her testimony. They discussed sending a letter to Democrat Diane Feinstein about the allegations. On July 30, Ford sent the letter to Feinstein, who is also most the senior Democrat on the Senate Judiciary Committee. Ford requested that she remain confidential. Meanwhile, Kavanaugh began holding individual meetings with members of the Senate. On September 4, Kavanaugh’s confirmation hearings in front of the Senate Judiciary Committee began. After reports began to surface about the letter sent to Feinstein, the senator released a statement on September 13, saying that she had “referred the matter to investigative authorities”, adding that “the individual [giving the information] strongly requested confidentiality, declined to come forward or press the matter further, and I have honored that decision”. Kavanaugh issued a statement on Septembber 14 after contents of the letter began to surface in the media. He said he “categorically and unequivocally” denied the allegations. “I did not do this back in high school or at any time,” he said. On September 16, Ford revealed herself as the letter’s author in a Washington Post article, describing the alleged assault. 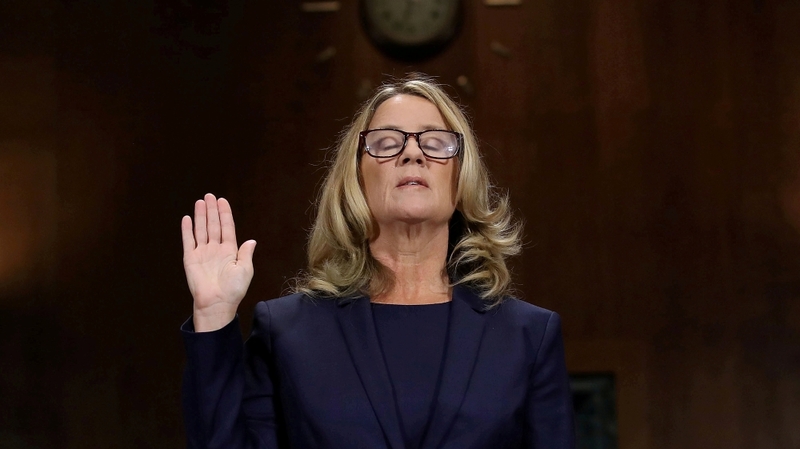 According to her testimony, Ford said she chose to come forward because it became clear several journalists had learned her identity. Both Ford and Kavanaugh said that they would be willing to testify before the Senate Judiciary panel about the allegations, and calls also began to mount to delay the panel’s scheduled vote for September 20 on Kavanaugh’s confirmation. On September 23, the Senate Judiciary Committee’s Republican leadership announced it was delaying its vote on the nomination, scheduling a hearing for the following week to hear from both Kavanaugh and Ford. New allegations against Kavanaugh also surfaced. Deborah Ramirez, 53, a classmate at Yale University in 1983-84 told The New Yorker magazine Kavanaugh exposed himself without her consent during a drunken party. Kavanaugh denied the allegations. On September 26, Kavanaugh released calendars from the summer of 1982 that he said disputed Ford’s story. Later that day, Julie Swetnick, who said she knew Kavanaugh during the 1980s, accused the nominee of engaging “in highly inappropriate conduct, including being overly aggressive with girls”, according to a declaration shared by her lawyer Michael Avenatti. Other more serious allegations were also made. The next day, Ford and Kavanaugh testified separately before the Senate panel. The emotional testimonies were watched live on television by an estimated 20 million viewers. 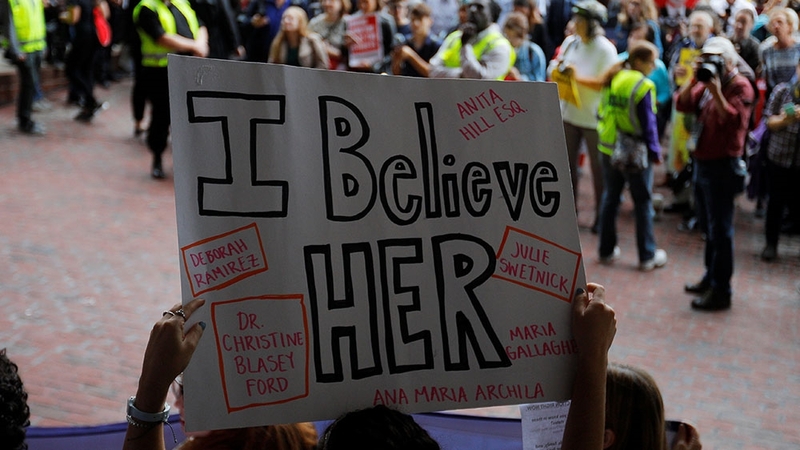 Social media exploded with commentary as hundreds of thousands of women, and men, came forward with stories of unreported sexual assault under #WhyIDidntReport and #BelieveSurvivors. Hundreds of women protesting Kavanaugh’s nomination have been arrested by US Capitol Police. Republicans questioned why Feinstein didn’t go to the FBI sooner, while Democrats called for a delay in the vote to allow for a full FBI investigation. Less than 24 hours later after the hearing, the Senate committee voted to back Kavanaugh’s nomination, but not before a last-minute demand by Republican Jeff Flake. Flake cast his decisive vote in favour of Kavanaugh only after asking the panel request the Trump administration pursue an FBI probe into the allegations. Later that evening Trump ordered the investigation, but said it should not take longer than one week. The FBI is currently conducting interviews with several individuals, including those who were said to have been at the party where the alleged assault took place. According to some Republicans, the notes from the investigation may be ready as early as Wednesday afternoon. The FBI will first send its report to the White House, who will send it to the Senate Judiciary Committee. The notes are not expected to be made public. The probe has been criticised by the lawyers of Ford, who said in a letter to the FBI on Tuesday that their client has not client has not received a response from anyone involved in the FBI’s investigation. The letter added that it was “inconceivable” that the FBI could conclude its investigation without interviewing either Ford, or all the other witness whose names she provided. Meanwhile, Senate Majority Leader Mitch McConnell, who called Democrats complaints “trivial”, has maintained that a vote on Kavanaugh will take place this week. A Senate vote on Kavanaugh could come as soon as Friday even as Democrats raised doubts about Kavanaugh’s credibility and women across the US expressed anger and shared personal stories following the nationally televised testimony of Ford. “Women are standing up, finally, and speaking their truth to power. And we’ve been silenced for so long,” said Toni Van Pelt, president of the National Organization for Women, a liberal womens’ rights advocacy group with chapters in all 50 states. After the FBI releases the notes from the probe, the Senate is expected to begin the procedural processes for a full confirmation vote to begin. Due to these rules, the actual vote may take place next week. Do Republicans have the votes? Most Republicans rallied around Kavanaugh, appearing to conclude Ford and the other women’s accusations were part of a last-minute character assassination by Democrats determined to block Kavanaugh, or any other Trump nominee, from reaching the high court. On Wednesday, McConnell accused the “far left” of trying to “bully” Kavanaugh, adding that “there’s not chance in the world they’re going to scare us out of doing our duty”. Democrats accused the White House and Senate Republicans of limiting the FBI’s investigation, even as classmates and former associates of Kavanaugh came forward to say he was a heavy drinker in college and law school and misrepresented his past conduct in Senate testimony. “This consistent dishonesty, disregard – even distaste – for the truth when it gets in the way of what he wants, in this case a seat on the United States Supreme Court, this in itself should be disqualifying for any Supreme Court nominee,” Senator Tammy Duckworth, an Illinois Democrat, told reporters. Three Republican senators hold the key to Kavanaugh’s confirmation in the narrowly divided US Senate where Republicans hold only a 51-49 majority. Jeff Flake, who is not running for re-election, said prior to the panel’s vote last week that he would vote to confirm Kavanaugh, but after delaying the vote, he has not announced how he now plans to vote. Two Republican women, Senators Lisa Murkowski of Alaska and Susan Collins of Maine, are also undecided. All three Republicans criticised comments made by Trump on Tuesday about Ford. Trump mocked the professor during a campaign rally in Mississippi for her inability to remember certain details from the night she said the assault took place. Flake called Trump’s remarks “kind of appalling”. Collins said they were “just plain wrong”, while Murkowski said the comments were “wholly inappropriate” and “unacceptable”, according to local media. Flake also said at a public forum hosted by The Atlantic magazine he was “concerned” about Kavanaugh’s “sharp and partisan” exchanges with Judiciary Committee members during his testimony last week. “We can’t have that on the court,” he said. The decision of two Democratic Senators will also be key. Both Heidi Heitkamp of North Dakota and Joe Manchin III of West Virginia are running for re-election in traditionally Republican states. Manchin and Heitkamp voted last year to confirm Trump Supreme Court pick Neil Gorsuch. Manchin told Al Jazeera he remains “undecided” on whether to approve Kavanaugh’s nomination and will decide after reviewing the FBI report. Manchin said he would assess whether the scope of the FBI review was adequate after seeing the report. “This has been horrible. It’s another circus,” Manchin said. “I am looking at the gentleman as an adult from 22 to 53, thirty-one years of professional service. I am looking at him as a father. As a person in a community, how he interacts with his community. I am trying to put the human side to it,” Manchin said. A successful Kavanaugh nomination would affect the balance of power between liberal and conservative jurists on the Supreme Court and likely the future direction of constitutional rights including the right to an abortion in the US under the 1973 landmark decision Roe v Wade. If confirmed, Kavanaugh would replace retiring Associate Justice Anthony Kennedy, 82, a conservative jurist nominated by President Ronald Reagan in 1988 who – as a swing vote on the court – had supported women’s rights, gay rights and human rights in a series of key decisions during his tenure. “This next appointment is going affect immigration, health care, and national security matters that are impacting our community,” said Abed Ayoub, national legal and policy director of the American-Arab Anti-Discrimination Committee, an advocacy group based in Washington. Either way, a confirmation or a rejection by the Senate coming just five weeks before national congressional elections is likely to send shock waves through the country.